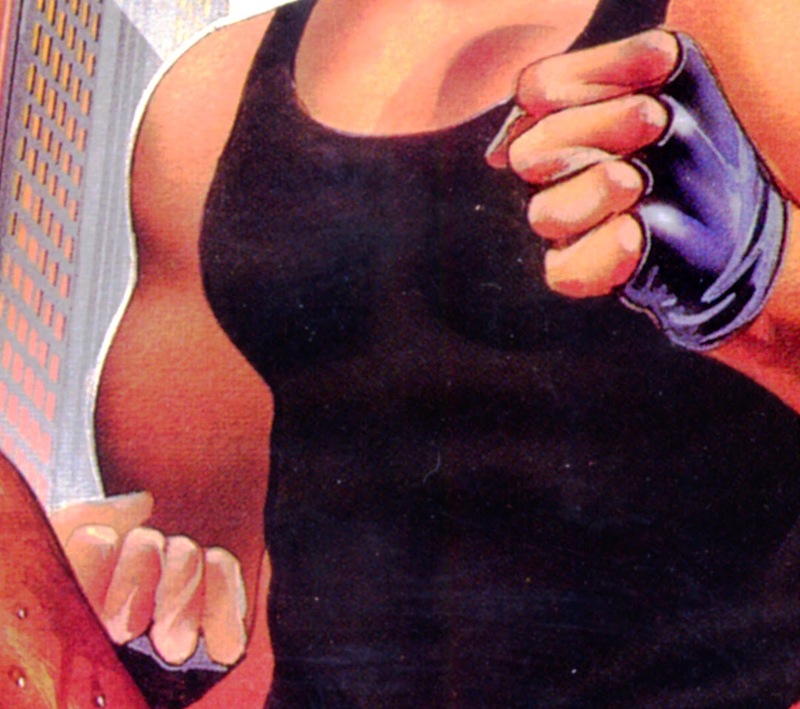 retrogameart.com: BAD DUDES Crash PRGE!! THE 1989 DATA EAST COVER REMASTER IS READY!! ….Are you BAD enough to rescue a PRESIDENT??!! BAD DUDES Crash PRGE!! THE 1989 DATA EAST COVER REMASTER IS READY!! ….Are you BAD enough to rescue a PRESIDENT??!! Blade and Striker are awaiting their orders, and find themselves surrounded by Ninjas and assorted bad guys in the Data East cover art awaiting you at the show!! chain and Shirukin equipped henchmen. IT'S ON!! ..But Striker needs to beware the Shuriken!! 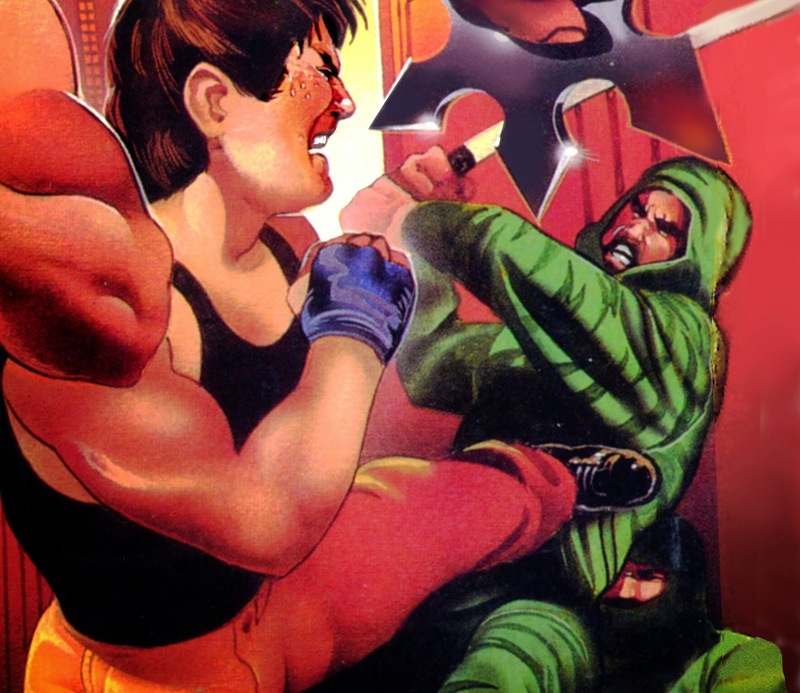 Striker lashes a roundhouse kick into the midsection of a sword wielding Ninja, as another waits for his opening to hurl his Kurumaken at Striker's jugular. The Metropolis is in an uproar, as the kidnapped president is being spirited away, as the Dudes fight for their lives, spinning, chopping and kicking to stay alive against the legions thrown against them!! 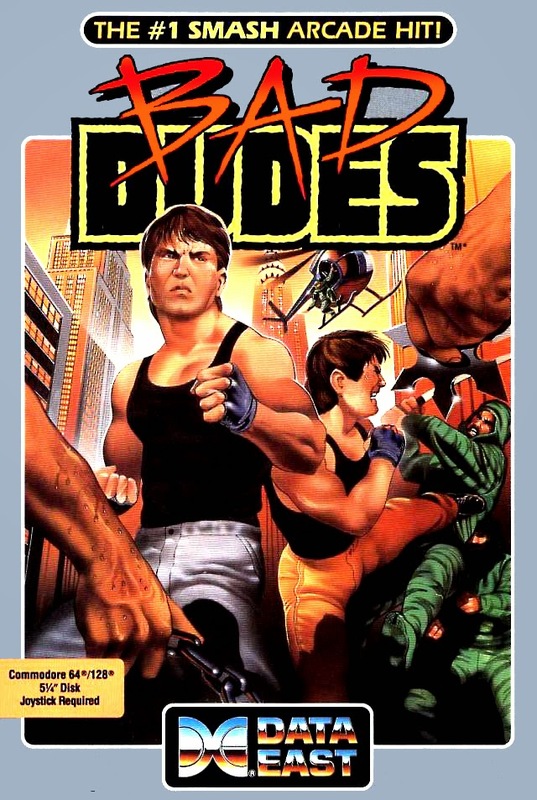 Bad Dudes has always been one of my favorite game covers. 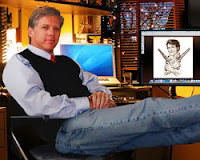 In September, 1988 I had been contacted by Connie Freeman at Data East about a fighting game with a plot that revolved around rescuing our President from malevolent forces. 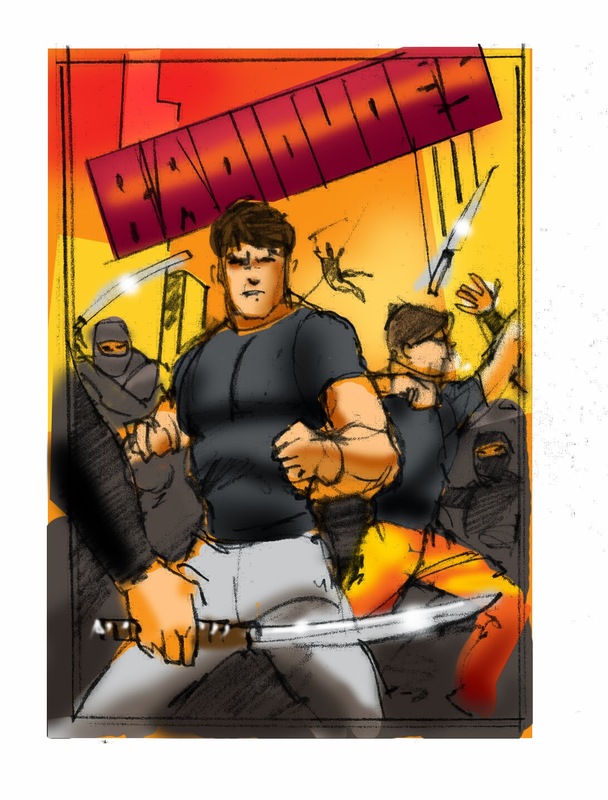 They wanted the two featured protagonists prominent on the cover, with drama and action, in a city setting. It sounded great and I got to work on step one of my process: The staging rough. This was typically a few quick renditions of possible arrangements for the illustration. would create these on demand while discussing the job in the clients office. The staging rough was followed by the color rough. In those days, I would xerox the staging rough, and proceed to work out my color suggestions at my North Beach studio in San Francisco, in ad markers, and a bit of gouache and airbrush. Again, a very quick exercise, usually under an hour. This I would send by Fedex to the client for approval. and very closely mimics what a color rough circa 1988 looked like. Now for the fun! Gathering together my cast of willing friends and associates, we always posed for one another, in this case my stalwart, Carl Buell, and an amazing North Beach martial artist by the name of Darryl Chan, an incredible guy! A Hollywood stunt man and actor he has appeared in Pirates of the Carribean, Dead Man's Chest, and World's End releases, and too many films to mention, since the day in '88 when we shot these. 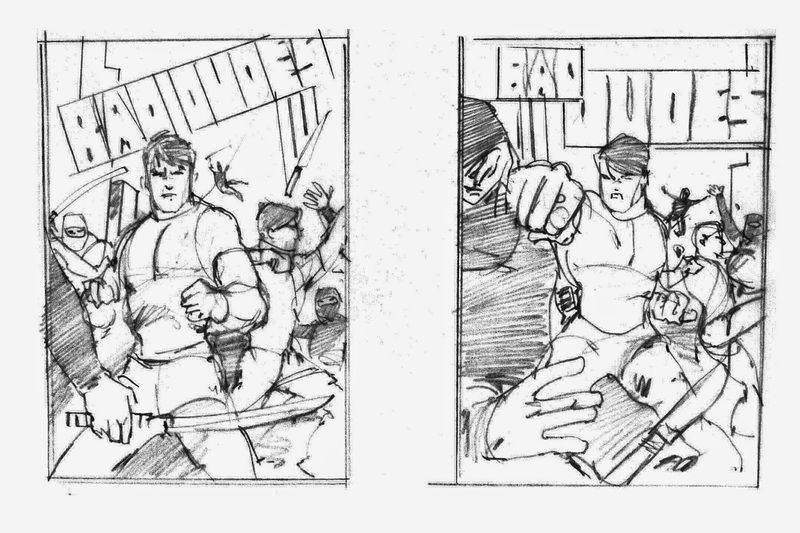 Darryl was critical in getting the major poses for Blade and Striker correct, as you can see in transparencies 4 and 13, and in pummeling Carl an me into submission throughout the shoot! AND so, the finished product:Available as a hand signed 18" X 24" Print at PRGE in October. This is the way the art looked when I delivered it to Connie Freeman at Data East in September of 1988. The company did a fantastic job on Logo and the graphic design, and gave us a package that stands the test of time. Still one of the iconic Boxes of the Retrogame Era. Other signed prints I'll have for offer: Mega Man 2, Galaga, Tengen Tetris, Tengen Afterburner, Herzog Zwei, Sega Genesis G-LOC, Sega Genesis Steel Empire, and others. THANKS FOR DROPPING BY!! I'II SEE YOU IN PORTLAND AT PRGE! !